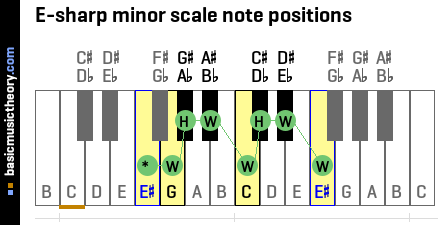 The Solution below shows the E# minor scale notes, intervals and scale degrees on the piano, treble clef and bass clef. The Lesson steps then explain how to identify the E-sharp minor scale note interval positions, choose the note names, and scale degree names. This step shows the ascending E-sharp natural minor scale on the piano, treble clef and bass clef. It also shows the scale degree names for all 8 notes. 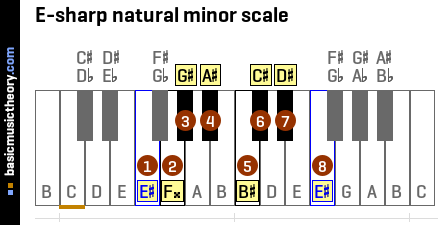 The E-sharp natural minor scale has 6 sharps, 1 double-sharp. > It is not on the Circle of fifths diagram, which contains the most commonly used keys. 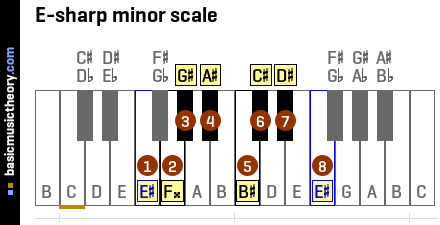 > There is always an identical minor scale that you can use in its place, which is on the Circle of 5ths. > The F natural minor scale sounds the same / contains the same note pitches, which are played in the same order (the scales are enharmonic), so it can be used as a direct replacement for the E-sharp minor scale. For the key signature of this scale, showing these symbols grouped correctly next to the bass or treble clef symbol at the beginning, have a look at the E# natural minor key signature. The difference between the E-sharp natural minor scale and the E# major scale is that the 3rd, 6th and 7th note positions of the major scale are lowered by one half-tone / semitone. So whereas the E# major scale has notes G##, C##, D## for the 3rd, 6th and 7th notes, these notes are lowered to arrive at notes G#, C#, D# for this natural minor scale. 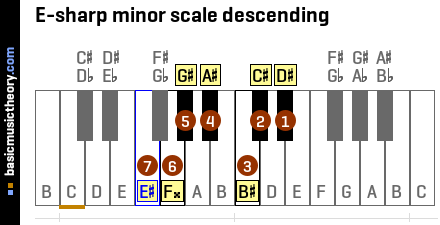 This step shows the descending E-sharp natural minor scale on the piano, treble clef and bass clef. This step shows an octave of notes in the key of E#, to identify the start and end notes of the scale. But since this is a scale in the key of E#, it is certain that notes 1 and 13 will be used in the scale. 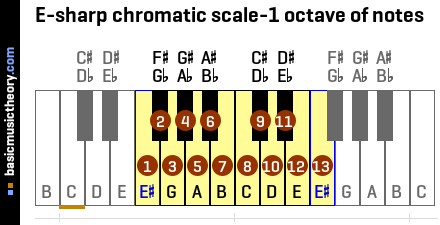 Note 1 is the tonic note - the starting note - E#, and note 13 is the same note name but one octave higher. This step applies the minor scale note interval pattern starting from E-sharp, so that the correct piano keys and note pitches can be identified. What is the difference between the E-sharp natural minor scale and the E# major scale ? 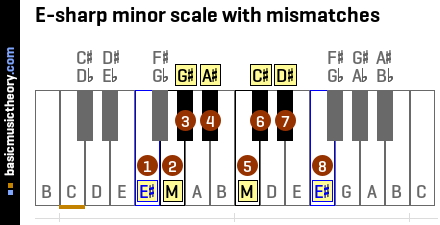 The match fails when trying to find a F -type of scale note, because either this type of note does not exist in this scale, or it exists but is in the wrong position number / table row for this match. But music theory rules allow the name of any note to be sharpened or flattened, even white note names, so since a F-type of note name is needed, the real scale note G will be renamed to F##. This step shows the notes when descending the E-sharp minor scale, going from the highest note sound back to the starting note. This step shows the E-sharp natural minor scale degrees - tonic, supertonic, mediant, subdominant, dominant, submediant, subtonic, and tonic. In contrast, the E# major scale has only one half-tone / semitone separating the 7th and 8th notes, and in this case the seventh note is called the leading note or leading tone, as the 7th note feels like it wants to resolve and finish at the octave note, when all major scale notes are played in sequence. Both the E# harmonic minor scale and E# melodic minor scale scales share the same property - having a leading tone, with the major scale.